Ever since I first saw the art of Simon Stålenhag, I’ve loved the idea of machines taking over a real world setting. In a fictional sense of course, though current events do have me reconsidering this line of thought. But Mr Stålenhag’s work does have a very specific look and feel, something that Generation Zero has captured perfectly. This could have something to do with both the artist and the game being of Swedish origin, with Avalanche Studios helming this particular slice of retro-futuristic sci-fi. Yes, you read that right, Generation Zero is retro-futuristic. In fact, it’s set in 1980’s Sweden, complete with brilliantly ridiculous fashion sense. But it’s not about the mullets and the too-tight denim, it’s about the hostile machines that are patrolling the roads and the disappearance of nearby communities. It’s about scavenging for weapons and ammo (and dubious articles of clothing that miraculously have bullet-resistant properties, but more on that later), stocking up on medical supplies and following the clues left behind by missing people. Avalanche’s latest doesn’t offer the brash, over-the-top Hollywood blockbuster experience of Just Cause 4, instead opting for a slower-paced, first-person survival shooter in Generation Zero. Guns aren’t military grade and they aren’t piled up in handy piles around every corner, because this is a rural island of farms and small towns, in a country known for its strict gun laws. Your first guns will be rusting pistols and hunting rifles, perhaps a shotgun, because you’re out in the countryside filled with woodlands, prime hunting grounds. Except you aren’t hunting deer to fill your freezer, you are the hunted and you’re just trying to keep yourself alive in the face of your impending extinction. I knew very little of the game before going in, thinking it was more of a co-op shooter like Left 4 Dead, rather than the open world, survival shooter it actually turned out to be. Honestly, having spent a lot of my time playing games like PUBG lately turned out to be the best preparation for playing this game. I spend most of my time wandering around empty towns and farms, keeping a wary eye out for dangers, all while searching abandoned houses for things to keep me alive. Thankfully I’m not murdered every fifteen minutes here, unlike my time in the battle royale arena. 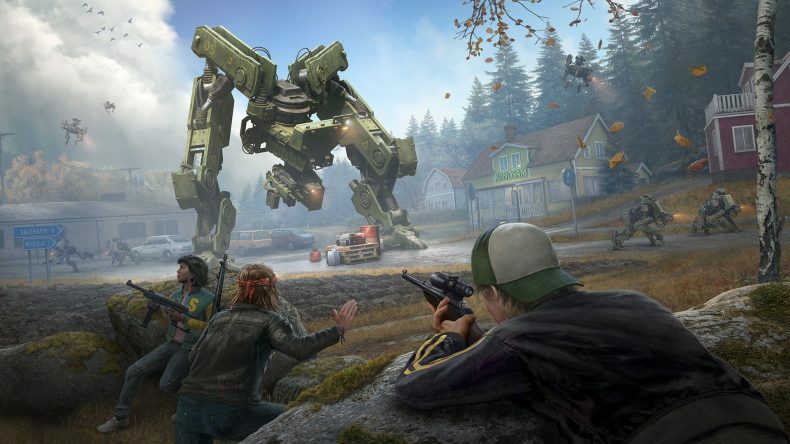 Not that Generation Zero’s enemies won’t do their best to fill you with bullets. Quite the opposite, in fact. 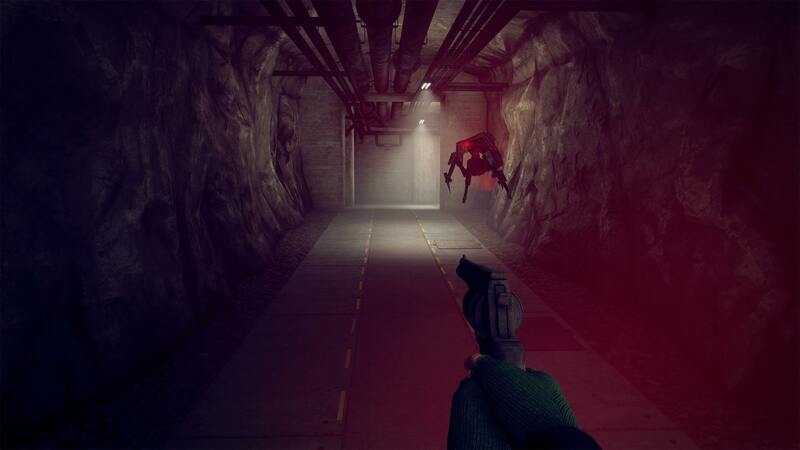 The AI will certainly give you a run for your money at times too, as the smaller, dog-like robots bound around with great speed, using cover and occasionally shooting a few rounds your way, with all the accuracy you should expect of a machine. If they get close, they may even simply barrel into you, knocking you to the floor and taking off a sizable chunk of your health. Due to the reasonably limited supply of health and ammo, you really do need to think about how you tackle each situation. I was caught out a few times by my own recklessness, trying to take out an enemy that I thought was alone, only for its buddies’ shots to ring out into the night, shots tracing lines toward my squishy human form, protected only by some tight denim and a gaudy-coloured shirt. The funny thing is, as this is a sort of FPS/RPG hybrid, the articles of dodgy clothing that you find throughout the Scandinavian islands often have protective properties. Honestly, it makes no sense whatsoever, as I’ve found military helmets that offer no protection whatsoever, yet the beanie I’m wearing has added bullet resistance. Work that one out. This also means that the weapons you find also have RPG-like stats, each coming with a handy star rating that will give you a quick idea of whether that rifle you’re carrying is better than the one you just found. Same goes for the attachments you can find, such as scopes and silencers, both of which can be absolute life savers in this hostile world. Indeed, the various types of murderbots have a keen sense of hearing. Or at least, excellent auditory sensors, if you wanna be pedantic about it. As you roam around the countryside, you might suddenly see a directional indicator around your aiming reticle, which will start off as a white dot that slowly fills out into a wide bracket that points in the direction of whatever is currently aware of your presence. It’s heard you running around like a bumbling idiot, basically. The best way to combat this is to crouch and move slowly, when around enemies. If a machine is actively searching for you but doesn’t yet know your precise location, for example when a silenced rifle shot has just exploded one of its mates, the indicator will turn yellow, then switching to red if you’ve been spotted. When that happens, you’ll really have to make the choice whether you fight or flee. Neither one is the wrong choice here. The further you get into the game, the more devastating the enemies become, and so sometimes you really should consider valiantly running away. This isn’t DOOM or Halo, it has more in common with S.T.A.L.K.E.R., requiring the use of strategy over brute strength. Stealth is particularly useful, especially if you are lucky enough to snag a silencer and a scope for your hunting rifle. 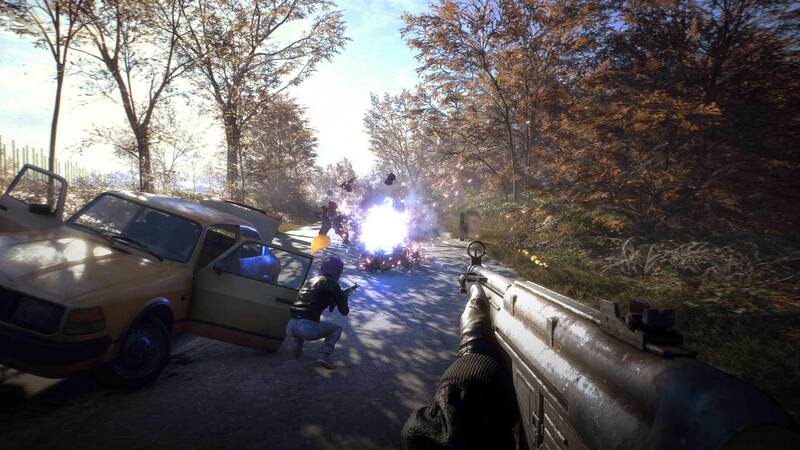 I can’t tell you how satisfying it is to shoot an enemy’s weak spot with a silenced shot, watching it explode and confusion falling upon its comrades. More often than not though, they will eventually determine the trajectory of the shot and come looking for its origin. You best not be there when that happens. Unfortunately, the AI isn’t without its faults. For the most part it works brilliantly, flanking and using misdirection to overwhelm you, but every now and again the game struggles with its boundaries. I’ve been shot through walls, because an enemy’s head and gun barrel have clipped through. Worse however, was when I discovered a new class of deathbot that clipped entirely through a wall and proceeded to violently smash me into the ground like the Hulk did to Loki in The Avengers. As if I wasn’t already panicking enough thanks to the atmosphere and the sudden arrival of this hulking killer, this cruel glitch made it ten times worse. 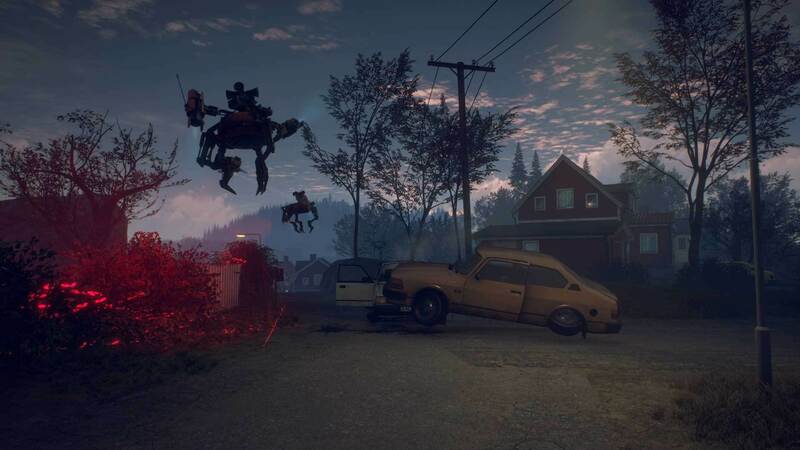 The thing is, aside from a couple of glitches and an element of random crashing that developed in the pre-release build, most of which seemed to be fixed just prior to launch day, Generation Zero is pretty special. From a visual standpoint, it’s incredible. The day/night cycle brings with it some astonishing lighting, and this quality presentation stretches to the sound too. I have never, and I mean never, heard a thunderstorm sound quite so perfect in a video game. And the sound of a heavy automatic rifle’s shots carry such weight, especially when they’re coming from another player’s gun upstairs, as you take up defensive positions in a house while fighting for survival. Indeed, Generation Zero has drop-in/drop-out co-op for up to four players, but before you click away from this review complaining about multiplayer ruining everything, you can set it to invite-only to continue playing alone. Multiplayer works seamlessly however, as you’re notified of another player entering your server and you can chat away via text, emotes or audio, and help each other take down whatever threats are around. This is practically required for the biggest machines, but otherwise it’s a feature that can be ignored if you so choose. It won’t be for everyone. The world could do with being a little smaller, or the movement speed could do with being faster, but I quite enjoyed just wandering around the environment and taking in the atmosphere at my own pace. Rather than being full of characters and cutscenes, the story is told via environmental cues as well as documents and voice messages, as you simply try to find your fellow humans on an island filled with murderous machines. And it’s those machines that have you fighting for your life with every encounter, in a hybrid survival game that really does feel a little bit different.